It is now crunch time for the prospects of the New York Rangers and New York Islanders as their regular season is entering their final month and before you know it the playoffs will be here. The 2nd half so far has been a coming out party for the Ranger prospects while the Islander prospects seem to be way too quiet for this time of the year. 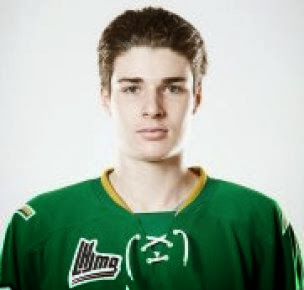 The one Ranger prospect who hasn't gone on a hot streak of some sort made a bit of a cameo on Friday evening as Ryan Graves (NYR 2013 4th) with a goal, an assist and 3 hits helped his Val-d'Or Foreurs to a 4-1 win over the Drummondville Voltigeurs. Graves who is known more for being a "stay at home" defender had the rare power surge to help his team earn their 4th straight win and move all the way up to 5th place in the overall QMJHL standings. Graves opened the game's scoring with his 4th goal of the season when he scored an even strength goal at 6:05 of the first period. Graves would add a primary assist on the goal that sealed the win which was an empty net goal at 19:01 and made the score 3-1. For Graves the goal was a new career high (4) while the assist set a new career high for points (17). Mackenzie Skapski (NYR 2013 6th) got back on the winning track with 32 saves in both regulation and overtime while stopping 4 out of 5 shots in the shootout to help the Kootenay Ice to a 3-2 shootout win over Ryan Pulock's (NYI 2013 1st) Brandon Wheat Kings. For Skapski it was his 22nd win of the season as he lowered his goals against to 2.67 and increased his save percentage to 0.919 as he helped the Ice increase their lead over the 6th and 7th place teams in the WHL (Swift Current and Brandon) 4 points behind them in the WHL's Eastern Conference. Jesse Graham (NYI 2012 7th) scored the winning goal in the shoot out as his Saginaw Spirit edged the Plymouth Whalers 3-2 via the shootout. Graham who had a primary assist in the win also set a new career high in points with his 42nd point of the season; For Whalers, Victor Crus Rydberg (NYI 2012 5th) was scoreless as his team saw it's lead in the WHL's Western Conference standings. Adam Pelech (NYI 2012 3rd) earned the game's 3rd star as his Erie Otters held off the Barrie Colts 3-2 while teammate Troy Donnay (NYR 2013 UFA) was held scoreless as their Erie Otters won their 3rd straight. Ryan Pulock was held scoreless by Kootenay as he has just 2 assists over his last 8 games; that is not good for the playoff chances of his Brandon Wheat Kings. 2nd ranked Minnesota with their trio of prospects were hosting number 11 Michigan with Cristoval Nieves (NYR 2012 2nd) as the 2 teams met as members of the Big Ten Conference for the first time in ice hockey. Minnesota with the bigger edge in play used a 4-1 scoring advantage over the first 2 period to earn a 5-3 win. Taylor Cammarata (NYI 2013 3rd) scored his 7th goal of the season on what I consider the game changing play of the game. Just 6 seconds after Michigan had scored to make it a 2-1 game, Cammarata stripped a Michigan defender just inside the blue line then broke in on a breakaway to score Minnesota's 3rd goal of the game. However 20 seconds after that play Cammarata took a bad "high sticking" minor which cost him his star for the night. Cammarata is now 7-10-17 on the season while teammates Brady Skjei (NYR 2012 1st) and Jake Bischoff (NYI 2012 7th) were both scoreless. For Michigan Cristoval Nieves (NYR 2012 2nd) was for the most part pretty much invisible as he was demoted to 3rd line left wing for this game. The 2 teams will face each other again on Saturday evening. Anthony Duclair (NYR 2013 3rd) had the primary assist on the game's first goal but his Quebec Remparts were beaten 5-1 by the Baie-Comeau Drakkar and fell 7 points behind the Drakkar for the Telus East Division lead. The Drakkar could have pulled to within 3 points of the Drakkar in the standings. Kyle Burroughs (NYI 2013 7th) and his Regina Pats have been taking advantage of their division mates going into slumps to heat up enough to jump into first place in the WHL's East Division after a 5-4 shootout win over the Prince Albert Raiders. Burroughs was scoreless but a +3 as his Pats won their 3rd straight game. Adam Tambellini's (NYR 2013 3rd) 4 game goal scoring streak ended but his Calgary Hitmen rallied for a 6-5 overtime win over the Saskatoon Blades. Tambellini who had 5 goals in his last 4 games was scoreless and a -1 as Calgary won their 5 straight game and pulled to within 2 points of the WHL Eastern Conference leaders the Edmonton Oil Kings. Steven Fogarty (NYR 2011 3rd) was scoreless with no shots as his Notre Dame Fighting Irish played the Providence Friars to a 2-2 overtime tie. Fogarty was demoted back to being the 4th line center. Doyle Somerby (NYI 2012 5th) was scoreless as his Boston Terriers spotted the New Hampshire Wildcats a 3-0 first period lead as his team settled for a 4-3 loss. Griffin Reinhart (NYI 2012 1st) along with goalies Stephon Williams (NYI 2013 4th) and Eamon McAdams (NYI 2013 3rd) were not activated for their team's games this weekend.